Do You Really Want to Make French Bread? I have been asked by someone who stumbled on my most recent blog, To Knead Or Not To Knead, if I would give more specific details about the French bread I make—in other words, a real recipe. That’s not easy with this kind of bread because there are a number of variables, from the climate to the water content of the flour. I am always experimenting, trying to make my loaves just a little better each time. My friend Jason Epstein, whose book Eating we just published this fall, would understand. He claims that he never makes something the same way twice, that he is always improving on it, so why write it down in a rigid formula? He prefers to treat a recipe as a conversation over the stove with a friend. So I am going to follow Jason’s lead here and ask you just to join me as I describe how I made my baguettes this past weekend. It was a gray, cold day that I baked them, spreading the warmth of the kitchen and the heavenly smell of bread baking throughout the apartment. First, you’ll need to check your EQUIPMENT. Unless you happen to have a wood-burning oven, you’ll need a baking stone measuring at least 14 x 15 inches that you set on the middle rack of your oven. You’ll also need something to create steam. The simplest method is to squirt some water over the loaves before they go into the hot oven and to toss of few ice cubes onto the oven floor just before you shut the door. I heat up an old flat iron, as described in my last blog entry, picking it up with sturdy tongs and plunging it into a pan of water. For INGREDIENTS you’ll need 3 3/4 cups or more of white flour. (You can use bread flour, if you have it, but I find Hecker’s or King Arthur’s unbleached, all-purpose flour is excellent); 1/4 teaspoon active dry yeast (I use rapid-rise these days); 2 teaspoons kosher salt; and 3/4 cup tap water. Two hours before I’m ready to bake I add 1/2 cup more flour and the remaining teaspoon of salt and let the dough hook mix it again. If the dough still looks too soupy, I sprinkle in another 1/2 cup with the dough hook turning slowly. Now I flour my work surface generously (mine is a marble-topped worktable) and scrape the dough out of the bowl onto it, sprinkling more flour on top. Very gently at first I start to knead, using a dough scraper to prevent sticking and folding the dough over onto itself. This is such a delicate, moist dough that I have learned not to push down too hard but to coax the dough gently with the palms of my hands, adding more flour as necessary. Gradually the dough becomes cohesive, then smooth, and it bounces back at me when I stick a finger into it. The kneading seems to take me about 6 or 7 minutes. NOTE: I often want to make myself a small pizza*—cook’s treat—so at this stage I will tear off a piece of dough between the size of a golf ball and a tennis ball and set it aside, loosely covered with plastic wrap, or I refrigerate it if I’m not using it right away. To return to the bread dough, I now wash out the bowl and put the dough back in it, letting it rise, covered again, for 1 1/2 to 2 hours, or until doubled in volume. Because this bread has less leavening, rising times are slower, which adds flavor to the bread. Now comes the famous forming of the loaves à la Madame Child. I scrape the dough out of the bowl again onto the floured marble, punch it down gently, and divide it into thirds. I take one third of the dough (leaving the other 2 covered with a towel) and pat it into an oval shape 6 or 7 inches long. 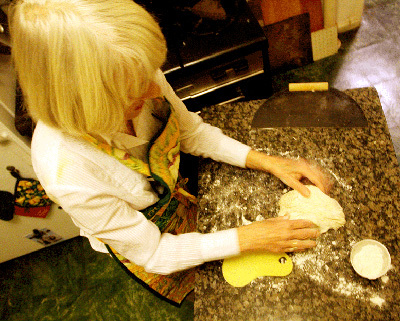 Then I fold the long sides toward the middle, overlapping, and with the side of my hand I press the dough to form a lengthwise trough down the middle. I bring the two long sides up and over the trough and firmly pinch the sides together. 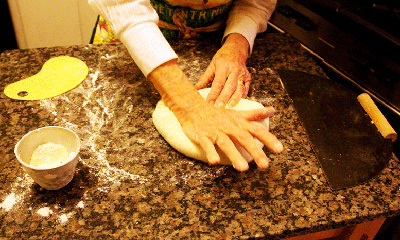 Flouring the work surface again, I roll out the dough with the palms of my hands, starting at the center and rolling toward the ends, stretching the dough as I roll it to about 12 inches (or slightly less if I’ve stolen a piece for my pizza). Now I quickly pick up that first rope of dough, which droops a bit as I transfer it to a kitchen towel that I have laid out, well dusted with flour. After arranging the loaf on the long end of the towel, I make a generous pleat in the towel to keep the first baguette separated from the next one. And now I prepare the remaining pieces of dough in the same way and lay another towel on top. While the baguettes get their final 30-minute rise , I preheat the oven to 475 degrees with the baking stone on the middle rack. I also heat up my trusty old iron over a gas flame. The last moment of excitement is at hand. The baguettes have doubled. I take my improvised baking paddle, well dusted at one long end with corn meal, and slip it just a little way under the first baguette; then using the far side of the towel I flip it onto the paddle, seam side down now, and make 3 lengthwise slashes on top with a razor blade held at an angle. I pull out the oven rack and I position the paddle at the far end of the stone, then jerk it so the baguette slips off the paddle and onto the hot surface. I very quickly repeat this maneuver with the two remaining loaves, shutting the oven door in between to keep the heat in. Now I put a pan of water on the oven floor and with my tongs grab the hot iron and plop it into the pan. The baguettes are done in about 25 minutes, although I always peek 5 minutes sooner to see if they have turned golden brown. When ready I remove the baguettes with tongs and prop them up so the air can circulate as they cool. Voilà. Try not to eat them until they’ve had at least half an hour to settle. *To make yourself a small pizza for lunch: Preheat the oven to 475 degrees. Flatten your reserved hunk of dough on a well-floured work surface and roll it out to a circle about 6 inches in diameter. Paint the top lightly with olive oil and fill the round with whatever appeals to you. I love eggplant so I grill some fairly thin, lengthwise slices of a small eggplant, brushed with oil, over a gas burner, until lightly roasted. Then I arrang 3 of those slices on top of the circle of dough, interspersed with 6 or 7 cherry tomatoes and topped with a heaping tablespoon of grated parmesan. Using the same jerking motion that I described for sliding the baguette onto the hot baking stone and with the help of a spatula, I slip the pizza into the oven, but if that unnerves you and you feel all the topping will tumble off, bake the pizza for the first 5 minutes on a regular baking sheet and then slide it onto the baking stone when the bottom has firmed up. Bake a total of 12 to 15 minutes, checking to see if the dough is crispy and the filling bubbly. The possibilities for pizza fillings are endless. See what scraps you may have in your fridge—cooked vegetables, a little sausage or ham, different cheeses, olives, peppers.